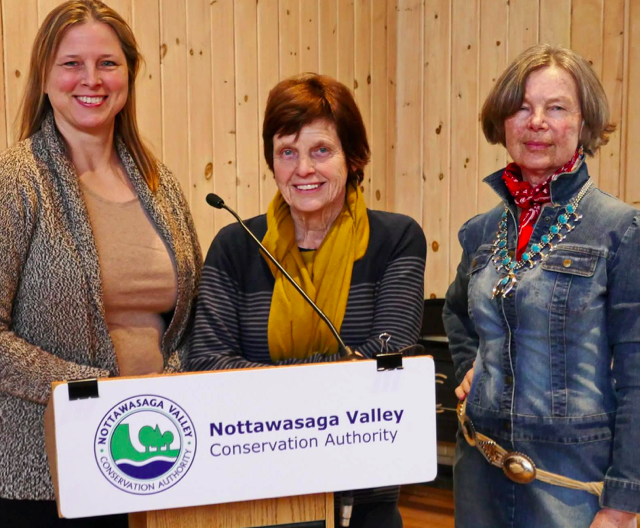 Members of the BMWTF attended the 2018 Nottawasaga Valley Conservation Authority (NVCA) AGM on January 26 at the Tiffin Centre in Utopia. Gail Ardiel, Deputy Mayor of The Blue Mountains was appointed the next chair of the NVCA Board of Directors. Ardiel joined the NVCA board in 2010 when many of its members were new and could see that changes were needed. A committee, formed in October 2013, soon initiated an Efficiency Audit. After serving for four years as Vice Chair, Ardiel felt that she was ready to step up to the role of Chair. Delighted to take on this new challenge, Ardiel says, “I’m very passionate about protecting and conserving our environment. I look forward to working with the BMWTF on our local issues. I look forward to working with and supporting the CAO Doug Hevenor and staff on important issues, especially those related to the implementation of the revised CA Act and the regulations. 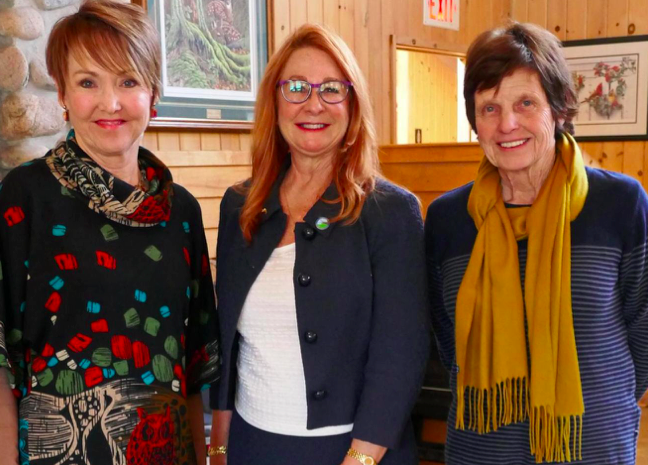 Funding and the implementation stages of Bill 139 are key for all of us.” The BMWTF congratulated Ardiel and look forward to collaborating on local environmental matters. Kim Gavine, General Manager of Conservation Ontario was the keynote speaker. Her topic was The Changing Landscape of Conservation in Ontario. Conservation Ontario is a non-profit organization supported mainly by Conservation Authorities (CAs). Gavine believes that CAs are in a position to be the lead voice for conservation in the province. Through Conservation Ontario, CAs are increasingly influencing policies with decision makers. Gavine talked about several challenges for local conservation authorities. Its effects are increased flooding and erosion, reduced flow levels in rivers, lakes, streams and groundwater, diminished cold water fisheries, wetlands and marsh habitats, poorer water quality; greater costs required to treat water, and greater competition for water supplies. Issues are increased property damage, risk to life from flooding and erosion, damage to public infrastructure, pressure for irrigation, and more frequent water restrictions. An overall loss of biodiversity, ecological health and productivity. Gavine also outlined the new Bill 139 that updated the conservation act. Its intent is to strengthen oversight and accountability (CAs will now be able to issue stop work orders); increase clarity and consistency in programs and services; increase consistency in regulatory requirements and enhance collaboration and engagement (clarity around when to hold public meetings). She discussed the role of municipalities saying towns can help to make the land more resilient by implementing conservation practices; they can implement risk management programs and policies; provide long term monitoring to help adapt existing programs; and develop a watershed plan to provide an overall framework to deal with a range of watershed management issues. Gavine explained that essentially the Bill modernizes the old Ontario Conservation Act of 1946. Although Gavine says she expects more funding there are no new funding mechanisms in the new bill. The cuts to transfer funding to Conservation Authorities made in 1995 have never been reinstated and, moreover, funding remains at 1995 levels. Gavine emphasized that under the new amendments, the oversight role of the Ministry of Natural Resources and Forestry (MNRF) over CAs will be more extensive. To what extent and the implications, it implies are yet to be determined.